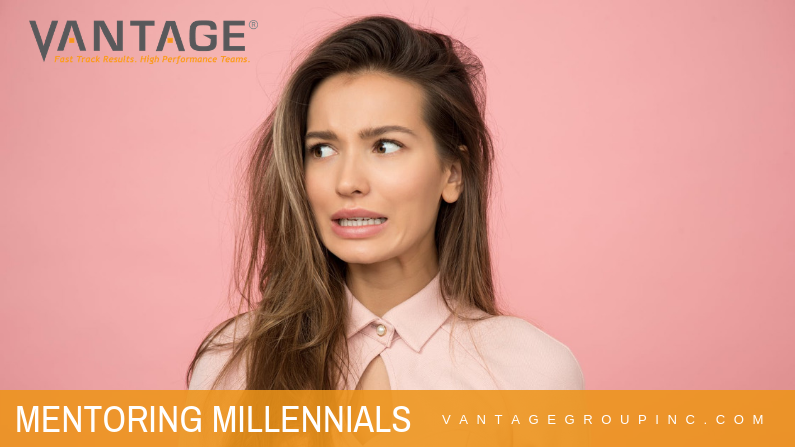 A Company’s Responsibility in Mentoring Millennials | The Vantage Group, Inc.
A tell-all from the managing partner of The Vantage Group on your company’s responsibility and investment in millennial workers. If you own a company or manage people in today’s working environment, chances are the term millennial has buzzed in your ear a time or two. Millennial workers are those born somewhere between 1981 and 1997 and are often described in popular culture as “fragile”, “entitled”, and “achievement-oriented”. Millennials aren’t afraid to question authority and they are confident – sometimes to a fault. This generation is thought to be all about purpose and fulfillment and if they don’t feel their personal needs and wants are being met, they’re likely to think about changing jobs sooner rather than later. Have you ever heard someone say, “I don’t really feel like I’m contributing much here” after only a few weeks or months on the job? Even as someone new to the career workforce or new to a company, millennials often feel concerned about their contributions and want to know that what they do matters. This is often the most challenging aspect employers face when navigating, nurturing, and educating millennial workers. What can you do about it? Below, Darrell Crawford, Managing Partner at The Vantage Group, provides some insight and recommendations on the top five employer questions about working with millennials. 1. How Do You Best Mentor Millennials? “If this question piques your interest, you’re likely an employer who understands that you have a responsibility to mentor the millennial generation,” says Crawford. In some ways, a lot of millennials have gotten a bad rap. They are called lazy, entitled, award-driven and focused on earning credit, and not great relationship makers. However, research and findings by The Vantage Group show millennials in a different light. In all honesty, millennials are more like lost sheep without a purpose; and so much of this lost feeling comes from their need to learn patience. It takes time to lead big projects. It takes time to make X dollars in salary. And it takes time to build clout and strong business relationships. Millennials often feel a need for instant gratification which hinders their feelings of worth and accomplishment in the workplace when real life doesn’t move as quickly as they think it should. Be an employer who helps millennials learn patience while offering freedom within a structured support and guidance environment. This helps in your effort to meet their need to achieve and feel accomplished, while simultaneously allowing them the opportunity to learn about how the working world functions. 2. How Do You Set Realistic Expectations and Guidelines for Millennial Workers? Unfortunately, there’s really no one size fits all approach or answer to this question. Finding top talent in millennials doesn’t stop after the hire. Successful onboarding and retention starts with identifying the key accountabilities and expectations for new employees, thereby setting the foundation for them to be successful. This all-important step creates immediate buy-in for new employees and should present a feeling of value and commitment from the organization. Fear not! If you’re an employer, we advise you not to throw up your hands and say the dreaded, “well, that’s just millennials!” Instead, help millennials understand entitlement versus hard work, perseverance, patience, or how to set realistic expectations. Be clear with what is expected of millennial workers and offer them guidance and support throughout the process. If they want to earn a bonus check or if they hope to get a promotion sooner rather than later, let them work toward these goals with everything they have… but be sure to give them concrete steps to get to where they want to be, and be clear about WHY those steps and timeline are needed. 3. How Do You Foster Talent and Teach Patience? Millennials need to understand what they are required to do and what they can do in order to get from point A to point B. Millennials need to talk about WHY the time between those two points is important and HOW getting experience and taking time to learn things is vital to their overall success. It is also important to communicate what millennials can learn from you and your company. Viewing your company as an important resource for career development not only helps in recruiting talent, but is also important for retention of that talent. Do you want to keep your talented millennials? Give them opportunities to learn. 4. How Do You Set Standards Around the Use of Technology and Face-to-Face Interaction As They Relate to Relationship Building? Companies must help their employees take the time to actually get to know one another other. Rushing into meetings, not spending time building teams, or focusing on the bottom line hinders collaboration and cohesiveness. Encourage technology downtime where employees, especially millennials, are meant to let their minds wander or talk to a coworker. When our minds wander or we engage in conversations, we often come up with new ideas and begin to understand new perspectives. 5. How Do You Organize a Robust Mentor-Mentee System Within Your Organization? The Vantage Group offers Executive Coaching* (see below*) services that can help managers develop in this area. Millennials will only learn patience from a person who’s actually patient; they need to see it and experience it for it to sink in. In some ways, it’s like Project Based Learning in the educational world: A teaching method in which students gain knowledge and skills by working for an extended period of time to investigate and respond to an authentic, engaging, and complex question, problem, or challenge. Unfortunately, companies in the corporate world “want things yesterday” and this mentality wreaks havoc on a millennial’s work process. Millennials need time to understand and develop their talent, and they need guidance from managers up the ladder to do so effectively. Make sure someone, or a team of people, are willing to show your millennial workers the ropes. This sort of hands-on approach will help millennials understand that a career often moves at a slower than expected pace and that it takes years of support, learning, trial, and failure to develop expertise and experience. What are you doing to cultivate great millennial talent so they don’t walk out the door discouraged? What are you doing to mentor and guide their learning process? How are you catering to the space they ultimately need to be creative and come to an understanding of what it means to do good work in the current working climate? Be a company with a process in place for cultivating millennial talent by offering a pipeline of mentors ready to share their experience and guidance. *The Vantage Group offers a partnership approach to executive coaching to help executives to be better equipped to deal with leadership issues such as leading change, recruiting and retaining key people, navigating organizational politics and working effectively with executive teams and boards of directors. It gives individuals specific tools and strategies that can be applied to their leadership development. Ultimately, coaching helps the executive to perform at their optimum level… no matter what challenges come along. Please contact us to learn how we can help you with your team performance.